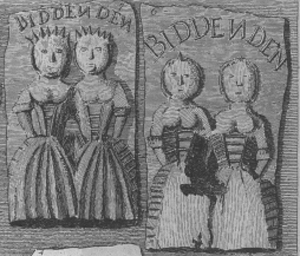 …Commonly Called the Biddenden Maids. Tenterden, Kent: James Weston, 1811. 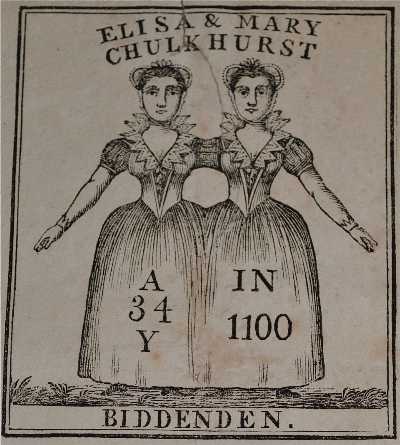 Born to parents of means in the year 1100, Mary and Eliza Chulkhurst - the Biddenden Maids - were joined at the hips and shoulders. 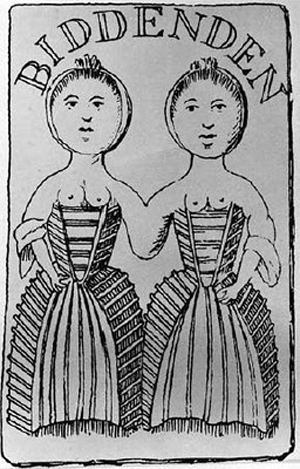 They are considered to be one of the earliest genuine cases of conjoined twins on record. "They were naturally very close friends, although they sometimes disagreed in minor matters, and had 'frequent quarrels, which sometimes terminated in blows'" (Anon. Antiquarian Repertory, vol. I. London: F Blyth,1775:17, as cited in Bondeson, J., The Biddenden Twins: A Curious Chapter in the History of Conjoined Twins, in Journal of the Royal Society of Medicine Volume 85 April 1992, p. 217). In 1134, Mary died after a sudden illness. When it was proposed that Eliza be surgically separated from her dead sister, Eliza refused. "As we came together we will also go together." She died six hours later. Upon their death, they left parcels of land in Biddenden to the church wardens of that parish, the annual rent for which was annually doled to the local poor. For many years, every Easter Sunday the Maid's charity distributed bread, cheese, and beer to the less fortunate. 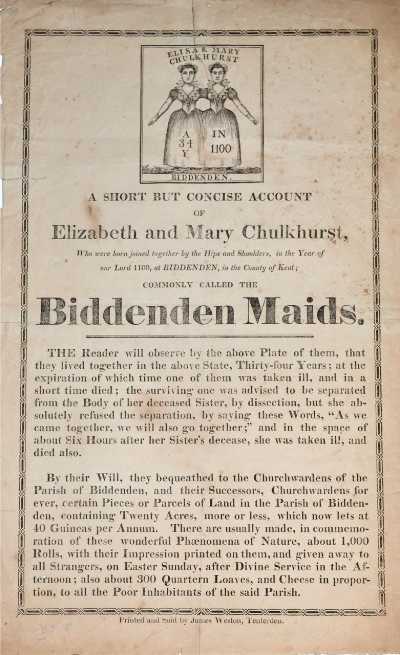 Ongoing for centuries, by the early nineteenth century the Biddenden Twin's charity was distributing near 1000 Biddenden cakes and 300 quartern loaves of bread and cheese in proportion. 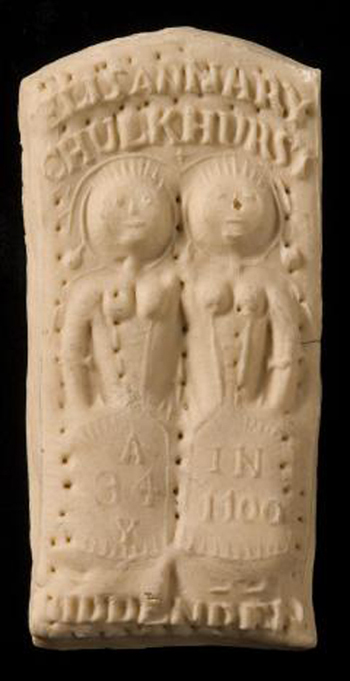 Plaster cast of an early biscuit stamp. As reported in 1895, "the income now amounts to about £40, and, as may be supposed, such a sum is sufficient to put Biddenden into a state of festivity for one day in the year. Visitors from neighboring places flocked to the village, which was turned into a kind of fair after the services in the church had been celebrated…There are two distributions under the will of the united sisters. In the first place, 1,000 hard-baked rolls, each stamped with a representation of the foundresses of the feast, were distributed among the visitors who might be in want of refreshment. They are very durable, as they are hard as wood, and may be kept as curiosities for twenty years. It would take the same time to digest them if eaten….The ceremony finished, many of the visitors attempted to soften their cakes in Kentish ale, and passed the rest of the day in Old World conviviality. Biddenden then resumed the quietude which it will retain until the memory of its twin sisters is celebrated next Easter Day" (New York Times, June 6, 1895). From the Antiquarian Repertory, Volume One. There has been some question about whether the traditional story of the twins is apocryphal or authentic. The incidence of twins conjoined in two places, at hips and shoulders, is extremely rare and most teratologists dismiss the possibility. Later historians were of the opinion that if the Biddenden Maids lived at all it was during the 16th or 17th century. Yet what was reported as conjoinment at the hips and shoulders was, in all likelihood, simply due to the custom of twins conjoined at the hips to walk with their arms around each others' shoulders; they only appeared to be joined at that place, too. The Biddenden Maids, Gentleman's Magazine, 1869. As far as Mary and Eliza Chulkhurst living much later than the 12th century, "the Maids [are] not mentioned in any of the major teratological works of the 16th and 17th centuries, such as those by Aldrovandi, Liceti, Pare,Schenckius and others. Nor [are] they noticed in the Philosophical Transactions or any other British collection of teratological descriptions. This is an argument against the opinion that they lived in the 16th or 17th century, since most other remarkable monsters that reached maturity occasioned much publicity in the popular and scientific works of this period" (Op cit Bondeson, p. 220). Further, "a medieval historical chronicle, the Chronicon Scotorum, tells us that in AD 1099, a woman gave birth to 'two children together, in this year, and they had but one body from the breast to the navel, and they were two girls'. 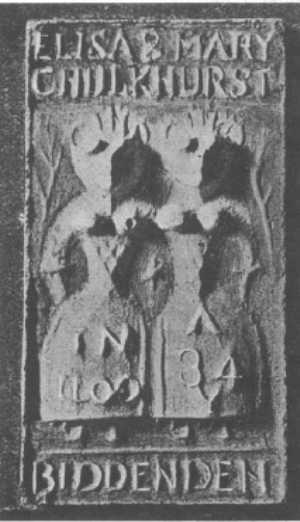 In the Irish chronicle Annals of the Four Masters is an almost identical description, although the conjoined twin girls are stated to have been born in 1103; in the Annals of Clonmacnoise their year of birth is given as AD 1100. These ancient descriptions are unreliable in details and probably dependent on each other, but in spite of this, they add some credibility to the old tradition that the Biddenden Maids were really born in 1100" (Op cit Bondeson, p. 221). Biddenden Maids' Biscuit, c. 1902. We refer and defer to newspaperman, Dutton Peabody, who, when he learned the truth, responded to Ransom Stoddard, the putative Man Who Shot Liberty Valance, "When the legend becomes fact, print the legend." And when the legendary biscuit becomes a real jawbreaker, eat the legend. Broadside image courtesy of James Eaton of Alastor Rare Books, currently offering this extreme rarity, with our thanks. Image of 1902 biscuit courtesy of England: The Other Within. Analysing the English Collections at the Pitt Rivers Museum, with our thanks.